Halloween fun at last. We had quite the fun week of festivities. It started Thursday with a party at preschool. There were lots of games to play. Pinning the nose on the Jack O'Lantern, pumpkin bowling, a ghost toss, and feeling ooey gooey guts (aka peeled grapes and cooked spaghetti - which Kaidrei tried to eat!). 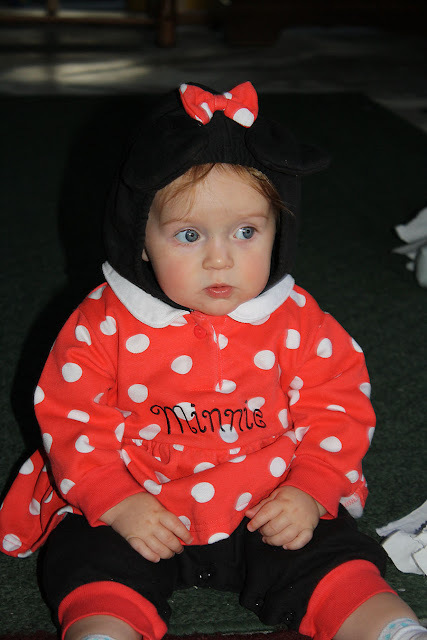 Minnie Mouse was not so sure about sitting and watching the action - I think she wanted to be a part of it. 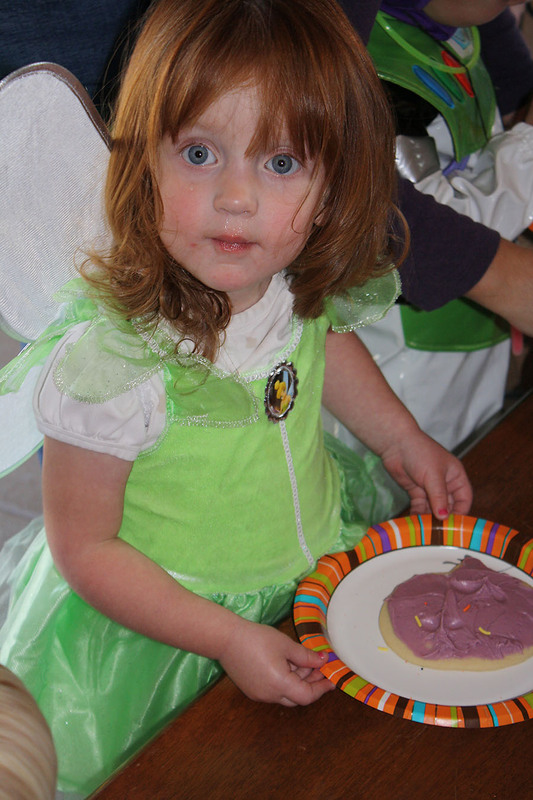 We decorated sugar cookies, had treats and fogging root beer. Our Cute Minnie Mouse watching as we broke open a pinata. Kaidrei enjoying the pinata spoils. 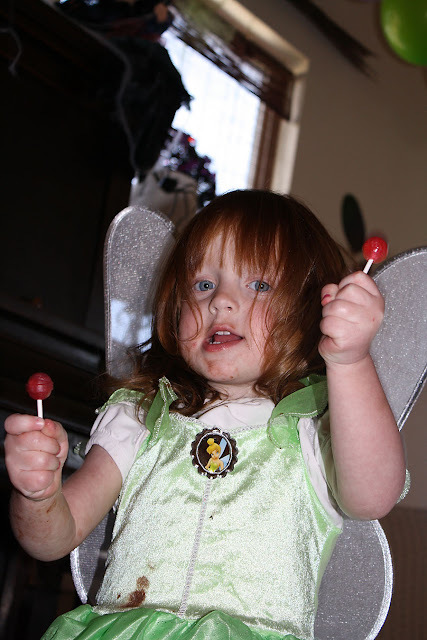 I thought Malea was too far away get any of the candy from the pinata, but I was so wrong. 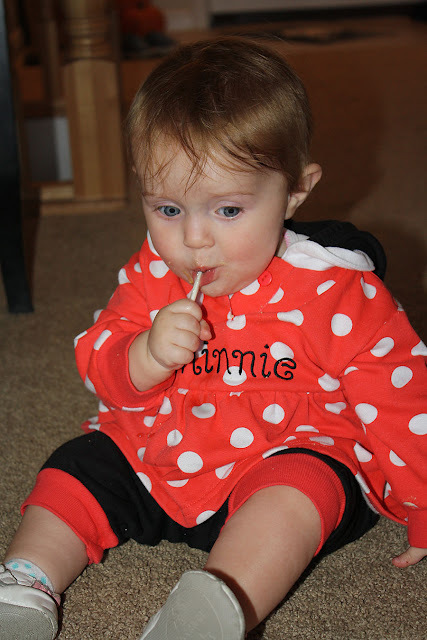 She snatched a lollipop and went to town! She was thoroughly enjoying her first lollipop. 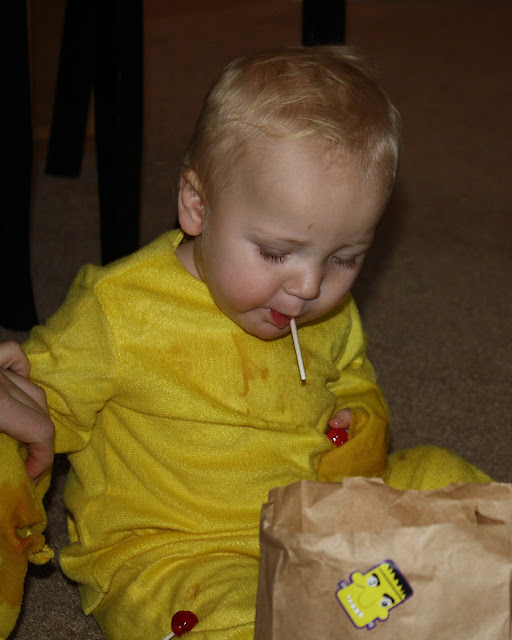 Little G was Woodstock (he is about 3 months older than Malea) and thanks to the sharing of the older kids he had three lollipops. 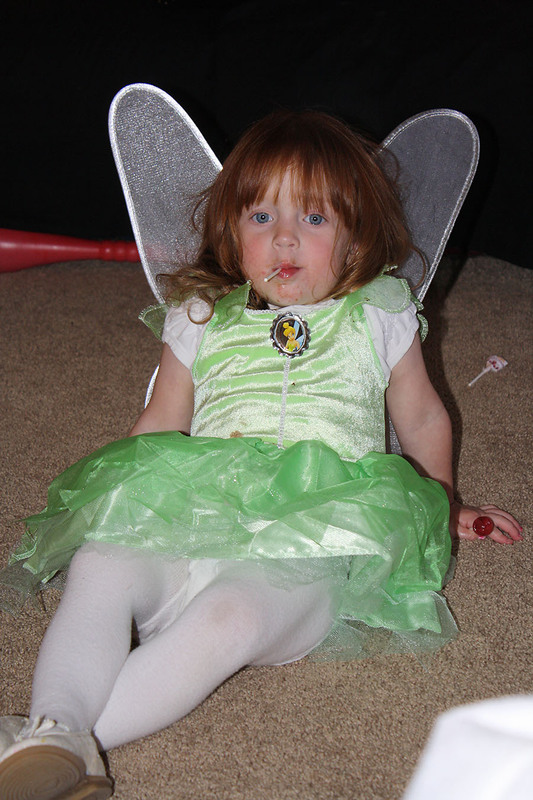 Tinkerbell relaxing after the festivities. 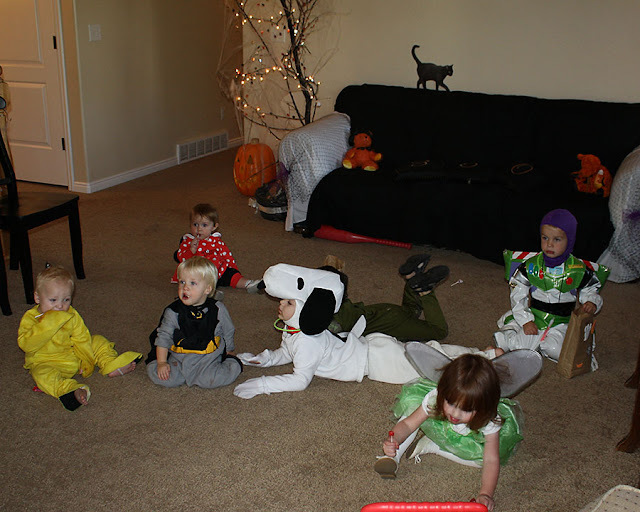 The crew: Woodstock, Batman and Malea (the younger siblings) and then Snoopy, Army guy, Buzz, Tinkerbell, and Thomas the train and Cinderella had already left. I sadly don't have any pictures from the rest of the whirlwind weekend. On Saturday Night, we went to the ward trunk or treat. As we were getting in the car, Brian explained where we were going and what was going to happen to Kaidrei. She got the biggest eyes, full of excitement and started clapping. 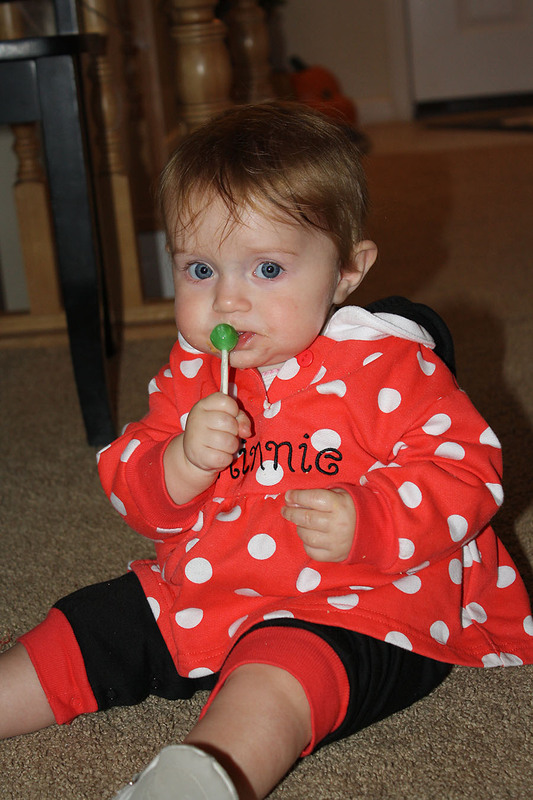 I guess you can't go wrong with costumes, other kids, and candy in the life of a child. It was a chilly night, but it was fun to see everyone all dressed up. Malea helped Brian pass out candy. Kaidrei was a little bit intimidated by asking for candy but loved walking around with all the other kids. On Monday we had a long fun day. We rode to Provo with Brian when he went to work so we could go to his work party that afternoon. We spent the morning playing with Char and Chayla, then met Brian for lunch and ran some errands. 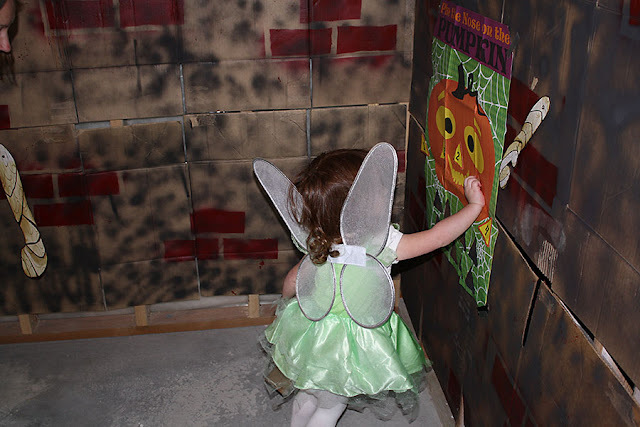 We came back for the party and Kaidrei and Malea trick or treated around the office. Kaidrei really liked this. Malea was a little overwhelmed by all the people. Then we ate at the potluck. There were lots of yummy foods, but Kaidrei seemed to think the best thing (and only thing to eat) was the filling out of Oreos. The drive home took about 2 hours and when we got there their were kids trying to trick or treat from us as we were getting the girls out of the car. 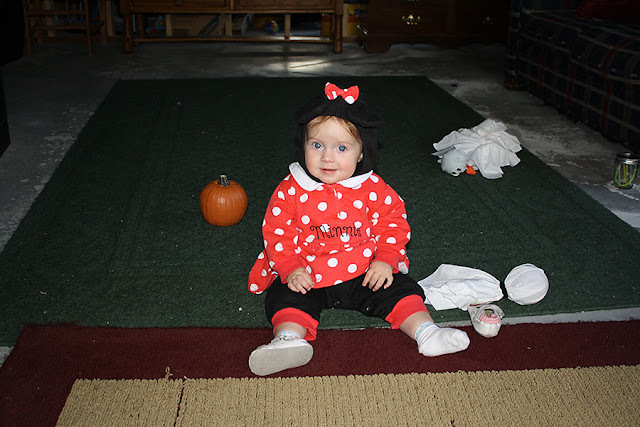 Kaidrei immediately wanted to go out trick or treating and it had to be RIGHT THEN! I took her around to a few houses, but she didn't want to walk and she didn't really want to knock on doors unless there were other kids there already. After trying to carry her while I was wearing an inflatable costume, I decided I was done and it was time to go home. Kaidrei was having major fits and didn't want to go to bed and didn't want to be awake either! We have learned a few important lessons of being a parent on Halloween. Naps are required...no matter what! Must eat real nourishing food before any candy and no oreo filling does not count as this! It was a good holiday. I'm excited to see how much different it will be next year as the girls get older.